← Charleston Home Buying Myths Slayed!! Well it did once, in 2008. But that was an anomaly. There was a good reason for that and it was nationwide. Don’t expect prices to go down again. Economies go into recession and this causes real estate to go flat. Sometimes you may see your real estate value stay constant for many consecutive years. But it never really goes down. Our analysis back to 1991 shows that current values in Charleston are where they should be on the long term trend line. We probably cannot sustain 7% increases for very long, but that does not mean there’s a bubble. Note that Johns Island sales are up 54.2% YTD in terms of number of transactions. And Daniel Island is up 28% YTD in terms of number of transactions. Daniel Island median sales price is also up over 20% YTD over the same period from 2017. This Property is located on HIGH GROUND and the street has a long history of NO TIDAL FLOODING. 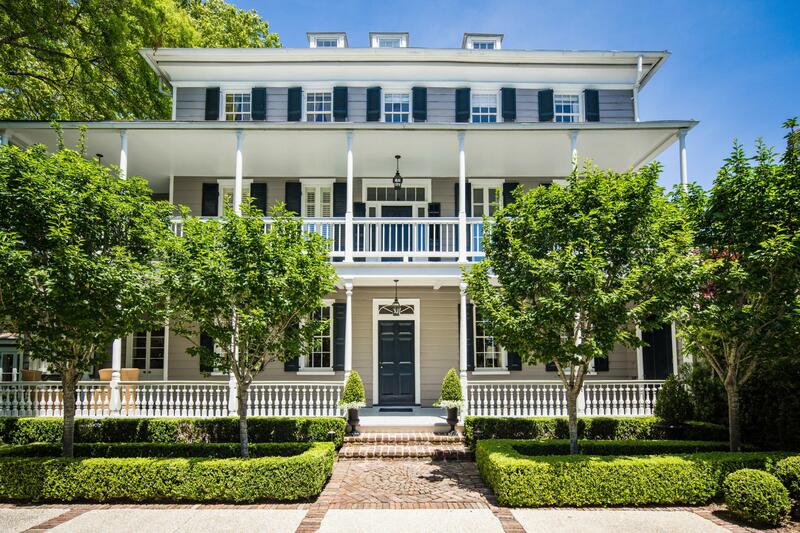 Listed as ''Valuable to City'' in This Is Charleston, this stunning, 1770s grand pre-revolutionary Georgian home has been meticulously restored by Glenn Keyes and Richard Marks. Located on a spacious double lot with southern exposure on one of South of Broad's most coveted streets. As you enter the home you are greeted by a beautiful foyer, detailed stair hall, and both formal living and dining rooms. The floor-plan is perfect for day to day living and for entertaining. Both formal rooms feature exquisite original woodwork, antique mantles and marble fireplace surrounds. The dining room features Zuber wallpaper and fine millwork. The gourmet kitchen is light and bright with large center island with seating, custom cabinetry, La Cornue range, Sub-Zero refrigerator & wine cooler, built-in ice machine, Miele dishwasher & oven warmer and fabulous marble counter tops. The kitchen seamlessly spills to large family room with fireplace, built-in bookshelves and cabinets. The lush gardens read well from this room and all rooms on the first floor. A powder room finishes off the first floor. On the second floor you will find the drawing room and master suite. The sun-drenched drawing room with fireplace and original woodwork is the perfect place to unwind with your favorite book or movie. The master bedroom has a beautiful fireplace with antique marble surround and is flanked with two closets. The marble master bath has a double sink vanity, makeup table, shower, soaking tub and water closet. The walk-in closet was custom designed and makes a great use of this space. The third floor has two large bedrooms and two full baths. The fourth floor features a bedroom, storage room and half bath. This home truly has it all! Enjoy the garden views from either piazza or two patios. Sheila Wertimer created two garden rooms that are tranquil and private with grand trees, palms and specimen plantings. Tasteful landscape lighting by Moonlighting has also made evenings in the garden just as magical as the day. A few additional details include: heart pine floors throughout, 7 fireplaces, smart-wired, built-in speakers, central vacuum, full basement, and off-street parking for 4 cars. This is one of the purest and most preserved Charleston Singles. The owners have done major renovations, so this home has been well attended and updated throughout. This is an exceptional home and a must see!